How Many ODI Master Repositories Should We Have? I frequently get asked how to setup a single OAM deployment to protect both intranet and extranet apps. Today I’d like to explore the issues and solutions around such a setup. So the specific request is how to set up OAM so that it can protect intranet applications that can be accessed only from within the corporate network and extranet applications that can be accessed from the public internet. The issue (or apparent issue) that people see with creating such a solution is that OAM 11g is configured with a single “front end host” configured through a global setting that governs what protocol (HTTP/HTTPS), hostname, and port are used when users must be redirected to the OAM managed server. If you go back and look at Chris’s post on the OAM 11g login flow and cookies then you’ll see that there are points in the flow where the user is redirected to the OAM managed server. This redirect can be to a load balancer or HTTP server fronting a managed server or cluster of OAM managed servers. So, OAM allows you through the “load balancer” settings to specify the interface that is fronting the OAM manage server(s). The issue is that there is only a single global setting for defining the front end host for OAM. 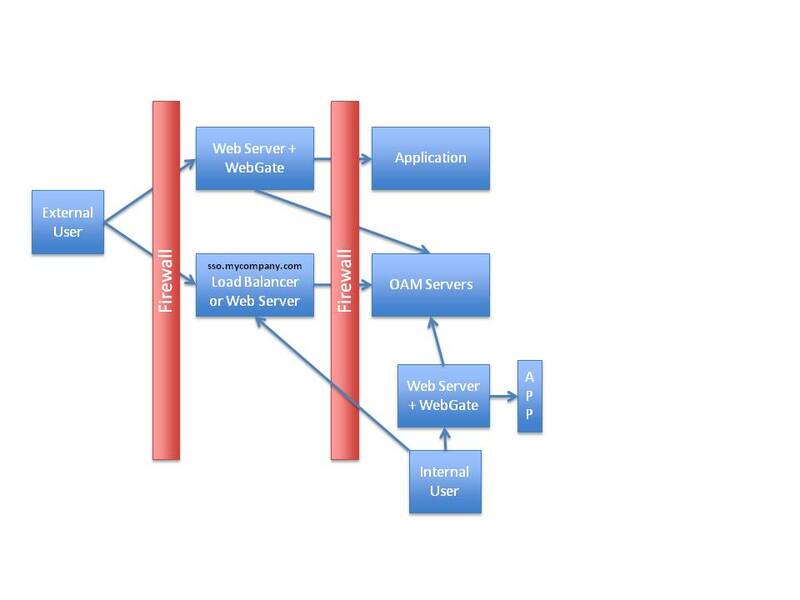 So people ask how can we protect intranet and extranet applications with one OAM deployment? There are in fact two solutions to meeting this requirement. The first solution is to simply specify an extranet (externally accessible) host as the front end host for OAM. 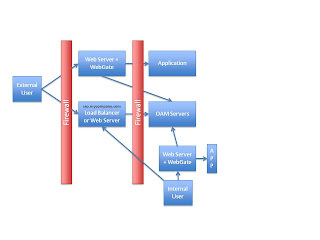 This way both intranet users accessing internal applications and extranet users accessing external applications from the internet can access the OAM server through the same front end host. This architecture is the recommended reference architecture for supporting this requirement. It is also the simplest solution to implement. The idea that you need to wrap your head around here is that even though your application may be accessible only from within the corporate network, that does not mean that your users cannot be sent at times (during login and initial SSO) to an externally accessible web server. I do sometimes hear objections to this solution from customers who say that they want to keep their intranet users on the internal network. I have to admit that I don’t fully understand this objection. When I inquire as to what specifically they are concerned about I usually get a fairly vague response. In addition, it should be noted that on many if not most corporate networks, the user wouldn’t be sent all the way out to the internet to access the OAM front end host but rather just to the DMZ. That being said, for customers that really want to keep intranet users on the internal network there is another solution. I found a really good article by Thomas Schinder that explains split DNS. You can read it here. 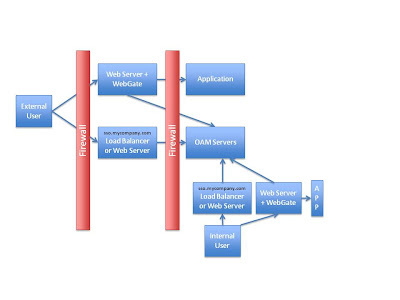 The basic idea specific to an OAM deployment is that you setup your DNS so that your front end host for OAM as defined in the load balancer setting (say sso.mycompany.com) resolves to an externally accessible load balancer or web server when users query the host from the public internet but resolves to an internal load balancer or web server when users query the host from the internal network. Split DNS works really well with OAM and is a completely viable option for enabling OAM to protect both extranet and intranet solutions simultaneously. There is a second unrelated issue that sometimes faces people wanting to do a single OAM deployment for external and internal applications and that is how their users are stored. There are many variations on identity store requirements for hybrid internal/external deployments and I will save this discussion for another day but I wanted to mention it now as something to consider if you are planning such a deployment. Over a year ago I wrote a couple important posts about the domain architectures used in Oracle Identity Management deployments. You can find these posts here and here. These posts have been very popular. I’ve received lots of positive feedback on them but also a fair number of questions. So, I thought that it would be worth revisiting the topic now. So, the central premise of my first post was that it is a good idea to install products from different distribution packages into different WebLogic domains. Specifically, I am recommending that customers install the IAM package (OAM,OIM,OAAM) into a separate domain from the IDM package (OID,OVD,OIF). Same thing goes with products from either package and WebCenter or SOA suite. The reason is that it introduces the risk that different components (libraries, jars, utilities), including custom plug-ins, from the different packages that you are installing in the domain might be incompatible and cause problems across your entire domain. Beyond the risk of such an incompatibility, you also must consider how installing multiple packages into one domain reduces your flexibility to apply patches and upgrades. The exception to this warning is SOA Suite for OIM. SOA Suite is a prerequisite for OIM and as part of the stack that supports OIM should be installed in the same domain as OIM. However, if you use SOA suite for other purposes, you should consider setting up a separate install for running your own services, composites, BPEL processes etc. In my second post I discussed whether or not to split up products from the same package into multiple domains. I argued that while the incompatibility issue isn’t such a big deal but that the additional flexibility of deploying in different domains could still be beneficial. I did warn though that OIM/OAM/OAAM integration is only supported with all the software running in the same domain. A year and a half later, I still strongly stand by the advice in my posts. I’ll put it this way, I’ve worked with people who regret deploying multiple packages into one domain for all the reasons I mentioned but all the people I’ve worked with who have gone with a split domain model across packages have been happy and glad they’ve gone that route. That being said, there are a few clarifications and updates to my advice that I’d like to now make. One thing that I want to make clear is that my advice about separating the products from different packages extends beyond domains to Middleware Homes which are the root directories for the Middleware products that you are installing together. To avoid the conflicts and restrictions that you can run into by installing multiple packages together you need to install them in separate Middleware Homes, just separate domains is not enough. It is true that most people just create one domain per Middleware Home but I’ve seen some examples of multiple domains in a Middleware Home recently so I thought this was definitely worth mentioning. The limitation that you have to put OAM and OIM in the same domain if you want the integration to work has, shall we say softened. I would still say putting them in the same domain is the easiest and most tried and true path (the yellow brick road if you will). However, if you utilize a real OHS based OAM agent rather than the domain agent; you can make the integration work with OAM and OIM in separate domains. In fact, the most recent IDM EDG for FA includes this option. Speaking of Fusion Apps, I do want to discuss this advice in the context of Fusion Apps. As I describe here, the IDM build out for Fusion Apps is prescribed very specific process with a specific architecture. It is very likely you will run into issues deploying Fusion Apps on top of an IDM environment that deviates from this architecture as FA has made certain assumptions about how the IDM environment will be set up. In the context of the domain discussion, the IDM EDG for FA does steer you down the path of creating one big IDM domain that contains OID, OVD, OAM, OIM, ODSM, and potentially OIF. This is of course contrary to the advice I’ve been giving. In the context of FA though I think this is OK. When using the IDM products with FA you are restricted to very specific versions of the IDM products in the stack, so upgrade flexibility and incompatibility concerns isn’t really an issue. Also, as I said, the FA provisioning process may be expecting the Oracle IDM/IAM products to be deployed in a single domain. So, for FA I advice people to follow the EDG and stick with the single domain model or moving forward whatever models are documented in the IDM EDG for FA. The use of a Web Tier is always recommended in a production environment, for security, performance and better control and load management, no matter if is a Intranet, internet or extranet environment. The most common use for the Web Tier with WebCenter is acting as Reverse Proxy to forward all requests to a frontend WebCenter site to the application server (Figure A), but there’s to many ways to do an enterprise deployment with a web tier and many flavors of web servers and load balancing options. Let’s start with the WebLogic plugin with supported webservers. You can found the standard plugins in your WebLogic instalation dir, that will something like “%WEBLOGIC_HOME%/server/plugin/%OS%/”, but I recommend you to download the latest plugin from Oracle’s OTN or eDelivery websites, you will found the Oracle WebLogic Server Web Server Plugins 1.1 or later. With the version 1.1 you will found plugins for Apache 2.2.x (32-Bits and 64-Bits) and for IIS 6+ and IIS 7+. Always confirm the OS support with the WLS Plugin Support Matrix. If you need support for iPlanet 6+ or 7+, you can use the version 1.0. Any throuble to found the files, try search or create to the Oracle support (Ref. : Doc ID 1111903.1). Some times you do not want to use a separate web server, you can use the WebLogic as a Web Server by using a servlet, but this is subject for another post. When you are deploying a WebCenter solution using a proxy server, you need to remember to proxy all your requests from all weblogics for Security, performance and Control and also all non-weblogic requests such as static files, WebCenter Content custom requests, Services, Portlets and 3rd Party. Is common in intranet deployments you see calls direct to the application servers, calls to several different servers, like the Figure C.
Above you can see the same sample with all calls using the web server, for proxy forward, for reverse proxy, static files caching, even the use of Oracle Coherence is easy when you have a WebCenter Spaces + Content deployment. We cannot forget to talk about the clustering and load balancers, Clustering is easy done by the WebLogic, you just need to follow the documentation. For Load balancing you need to choose what kind and what load balancer you will use. You can do load balancing using the Web Proxy Server with WLS Plugin or a servlet as mentioned above or a External Load Balancer (Hardware) or Appliance. Using the WLS Plugin you will need to remember to create a entry for WebCenter Server that are you using, that means that you need to create a entry for the /webcenter/ another for the /cs/, another for the “custom sitestudio” calls, for the portlets (If you do not create a parent folder for the portlets, you will need to create a entry for each portlet) and an entry for any other 3rd calls. For a External Load Balancer (Hardware) you have many options, such as the f5 Big-IP, a guide to help you deploy with WebCenter could be found here. There’s a option to use a hybrid configuration, with Hardware loadbalancers and Web Proxy to handle the web calls between the users and web farms, and web proxies and between the proxies and applications servers. For starters, allow me to introduce myself. My name is Brian Eidelman and I am a new member of the Fusion Middleware Architecture Group (a.k.a the A-Team) and a new contributor to this blog. 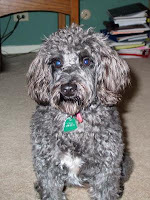 Since the memo has gone out that in addition to security we will be discussing dogs now, I’d like to introduce my faithful companion Coco.